Slipstream Sports is thrilled to confirm it has retained the services of Mike Woods for the 2018-2019 seasons. A latecomer to the sport, Woods stepped up to the WorldTour at the age of 29 with Cannondale Pro Cycling Team in 2016. The Canadian led the team in his first race in argyle, the 2016 Santos Tour Down Under, where he finished fifth overall in his WorldTour debut. He recently completed his second Grand Tour, the 2017 Vuelta a España, where he managed a solid seventh place on general classification. "There was no question that we wanted Mike to stay with us," said Slipstream Sports CEO Jonathan Vaughters. "We knew he was capable of the performances he put in this year if he was managed and mentored properly, and we think we're still uncovering the depths of his potential. Mike is motivated, bright and open-minded. He's an asset to our program." "The team has put their faith in from the start," said Woods. "They were the first team that reached out to me, and they gave me a leadership role in my very first race - which is even harder to wrap my mind around now than it was back then. I'm happy to have the opportunity to pay back everyone for the trust and support they showed me during these next two years." While Woods' 2016 debut showcased his promise, his season as a whole was marred by a series of frustrating set-backs. Woods suffered multiple injuries and poorly-timed illnesses. 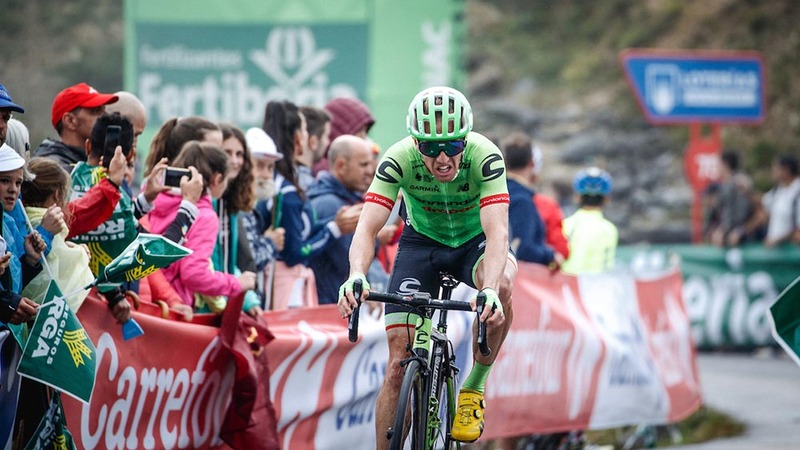 He first missed out on an anticipated Giro d'Italia start and then a Vuelta a España start. He crashed out of Liège-Bastogne-Liège with a broken hand only four days after poor positioning at Flèche Wallonne cost him a chance to contend for the podium. "I couldn't get out of my own way," Woods reminisced. "I had the legs but not the experience or the confidence. My teammates were exceedingly patient with me - especially Alex Howes and Simon Clarke." Woods started his second season in Adelaide, Australia where he hoped to contend for the overall win at the 2017 Santos Tour Down Under. He finished in 21st overall. "It messed with my head a bit," Woods admitted. He suffered through a cold and wet Paris-Nice and came out swinging at Volta a Catalunya. His results - ninth, 11th and 12th on climbing stages - belied the improvements he made and glimmer of tactical nuance he began to show. By season end, Woods was climbing with the best, displaying race savviness well beyond his WorldTour years and brimming with newfound confidence. "The things that I've accomplished this year are a result of my development by this team," said Woods. "I am so grateful that Vaughters found a way for Slipstream Sports to continue and that EF Education First stepped up to partner with us. I had other offers, but there's nowhere else I'd rather be than here." "Beyond the support I've been offered, I have made great friendships with my teammates, our staff and our sponsors," said Woods. "It wouldn't be the same riding anywhere else."